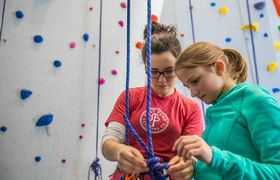 We believe that rock climbing is more than a sport; it is a vehicle for growth and self-discovery. Our indoor facility is located on the coast of Maine where mountains, rivers, and ocean meet. Exploring outdoor climbing areas like Rumney, Cathedral Ledge, Acadia, and more.